In any event, this tutorial will cover the how to of removing your profile from Apostolic Singles Network. 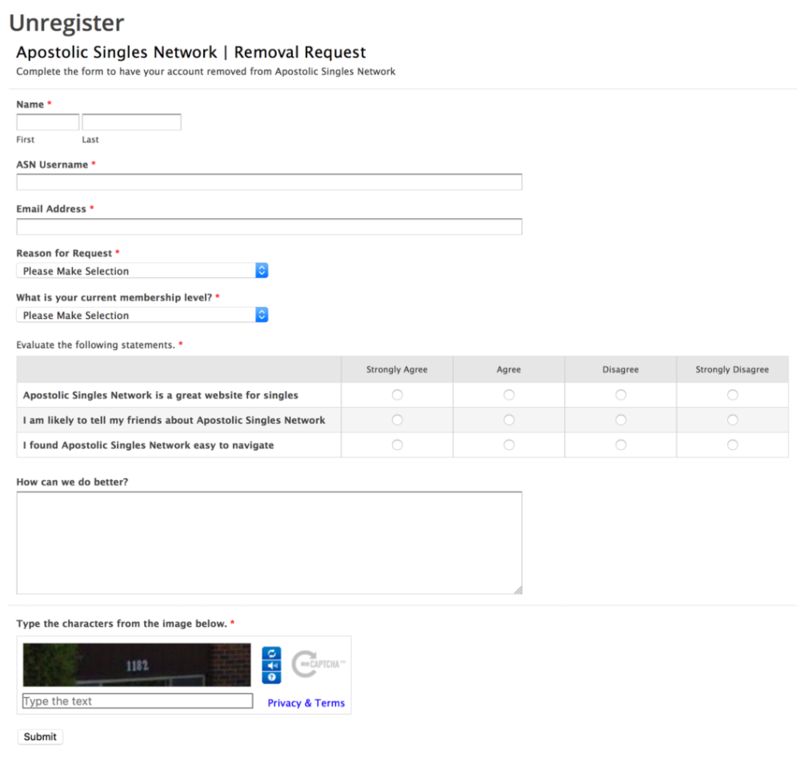 Login to your Apostolic Singles Network account and navigate to My Account→Account Settings→Delete Account. Next you will be directed to the following form. Complete the form and click submit. Finally, you will be directed to the confirmation page to confirm that you really want to delete your profile. All you will need to do at this point is click the Delete Account button and we will take care of the rest. Please keep in mind that if you confirm the deletion of your profile, your profile information will be permanently removed from the site. We will not have any way of reversing this action. You may continue to receive emails from us even though your profile has been removed from the website. You can always unsubscribe from our future emails by simply clicking the "unsubscribe" link at the bottom of the email. You will be automatically removed from further email communications. As always, we appreciate the time you spent with us and wish you the very best in your search for the "one" you can love and cherish.